Hi, my name is Ryan McEniff. 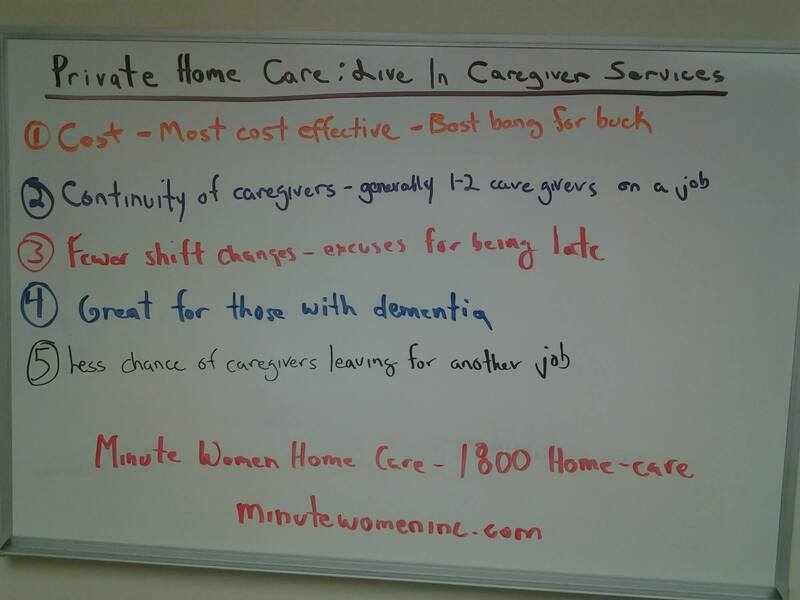 I’m the owner of Minute Women Homecare, and today’s video this week is going to be on live-in home care services and the benefits of them. There are five benefits that I believe people should look at live-in services when they’re looking at private care, and we’ll just jump into it. The first one is cost. The reason why this is such a great benefit for people is that it’s a flat day rate versus an hourly rate. Once you start using over eight hours, 10 hours of care per day at an hourly rate, it might cost you the same amount of money just to get a flat rate live-in home care service where somebody’s there for 24 hours a day. The second reason is it’s the continuity of caregiver. Going back to since it’s a flat rate, you’re generally gonna have the same caregivers in the home every single week. The way that we do it is we have two caregivers. One for Monday through Friday, and one for Saturday and Sunday. Two caregivers, and it makes life a lot easier for everyone. The third reason, going back to having less caregivers is that there’s fewer shift changes. Since you only have two caregivers in the home and it’s a day rate versus an hourly rate, you have less shift changes and less chances of people hitting traffic, being stuck because of weather, running late just because life gets in the way, or whatever reason it might be. Less shift changes means that less chance that people aren’t going to be showing up on time for their job. The fourth reason is for dementia patients. Obviously, live-in home care can be used for many different people, but dementia patients it’s really great. One reason because a lot of dementia patients are wanderers, and they need 24 hour care, and secondly, if you have dementia, you like continuity, you like seeing the same thing over and over again, and having two caregivers a day, excuse me, two caregivers per week versus having multiple shift changes with multiple caregivers, helps dementia people stay calm and enjoy aging in their home. The fifth reason for this is there’s less chance of a rotating cast of caregivers in the home. What I mean by that is, caregivers are looking for jobs as their livelihood. This is how they put food on their table for them and their family. So, if you have a job that has four or five hours a day of care and they are offered another job by another agency for eight or 10 hours a day of care, there’s a chance that they might take that job and leave the job we’re on. It’s not an ideal situation, but it does happen because they’re looking to better their family and better their lives with as much hours as they can get. But, when you have live-in care, those people there 24 hours a day for a five day or a two day duration, and there’s less chance of somebody leaving the job. If somebody leaves the job, it’s usually the person that’s working the Saturday and Sunday shift and not the main caregiver that’s working the five day shift. So, those are five reasons why I would really suggest people who are looking at private homecare to look at live-in services. It might be really beneficial for you and your family. Again, my name’s Ryan McEniff. Thank you for watching and we’ll have a video next week. Thanks for watching 5 reasons live-in home care is right for you!